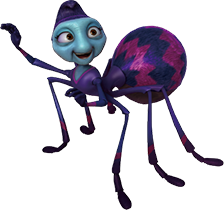 Wouldn't it be great fun for an animated series to focus on the lively workings of the insect world, just as children started exploring the wonders of nature for themselves? 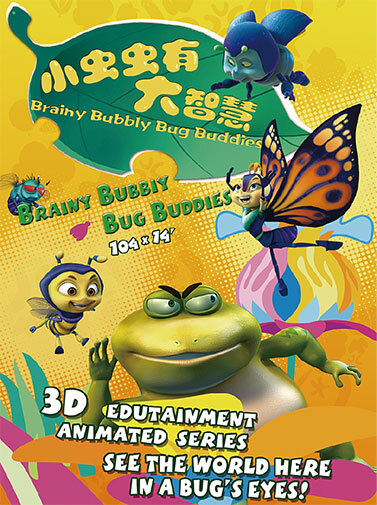 In Brainy Bubbly Bug Buddies, audiences will be given an insight into the habits and habitats of actual insects of many kinds, and will learn how these creatures thrive in their environment—a lush wetland called The Marsh. There our insect characters all are savoring life in their own ways, always making the place buzzed with activities. 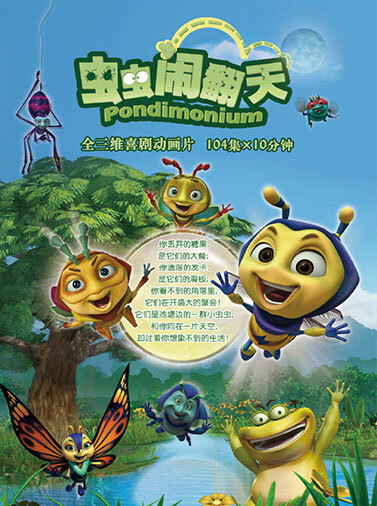 Our little viewers will no doubt be captivated by the lively blend of action and discovery to be found in the colorful environs of The Marsh, and visits to The Marsh will delight and intrigue, all while nurturing their budding quest for knowledge—and imbuing them with a healthy respect for life in the natural realm. In the tiny nooks and crannies of this verdant hideaway, a thriving little insect colony is abuzz with activity. Residents face a variety of challenges, but caring neighbors always come through when the going gets tough! So come along with us—join butterflies and bullfrogs, bumblebees and bumbling blowflies as they learn—sometimes the hard way—that it's teamwork that paves the path to success! Pondemonium highlights the child-like curiosity of the denizens of The Marsh, and does so with warmth and humor. Engaging characters approach new discoveries with wonder in the lush environs of this balmy haven—and kids won't want to miss a single episode! 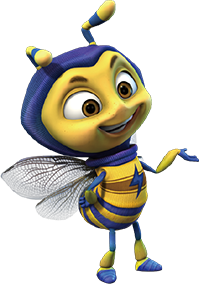 A smart fellow like Bartle Bee feeds more on knowledge than on nectar. He is an uncommonly observant honey bee, and the most reliable troubleshooter in the Marsh. This butterfly enjoys flitting among the flower buds and basking in the warmth of compliments on her great beauty. This tough critter is well-known in The Marsh for his extraordinary strength and stamina. McBroom's not much of a talker; this beetle's more at home on the job—and clearly, he doesn't mind getting his hands dirty! Niddy the spider is a respected elder, and she cares for others through the gentle dispensing of advice—only some of which actually gets through to the naughty youngsters of the Marsh. Strobe is the elder brother of the firefly twins. He is the more adventurous of the two, sometimes even becoming reckless if he feels a given mystery bears further investigation. 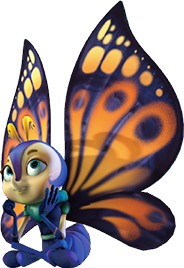 Sparkle, the younger brother of the firefly twins, is mild-mannered—Strobe would even call him timid, especially when Sparkle hides his glow if sensing danger in the area. 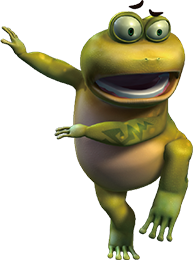 Joe Croaker is the only frog in The Marsh, and he can be a bit gruff at times about Bug Buddies "trespassing" around "his" pond. Joe throws his considerable weight around where possible, but secretly accepts that he'll never shape the pond into a Bug-Free Zone. 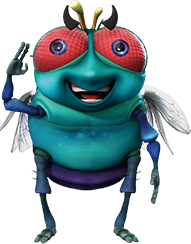 This red-eyed fly is Joe Croaker's right-hand pest. He lives in a rusty fish can, and has earned a not-so-delightful reputation as one who feeds on trash—as well as on the misfortune of others.